There's not a lot more frightening than an old and neglected doll. What once was a treasured toy has transformed into a terrifying relic of the past. These two didn’t even make it out of the factory. They were found by a traveling coven of witches who found that their time in the shadows transformed them into a perfect vessel for their black magic. All they needed to do was find a place to put the candles on them, and cast a few spells onto them. Eventually they became a little too powerful for this group of spellcasters and they were cast aside once again. Now we’ve decided (or mind controlled into, not sure which) to help them find a wonderful new home in time for Halloween. If you really feel like creeping your friends out until they don’t like sleeping ever again, put this in a nice, dimly lit room at your next Halloween party. Usually they don’t move around or try to possess people, but all the same we’d recommend you still pay close attention to the throughout the night too. These are cute, but very light plastic. 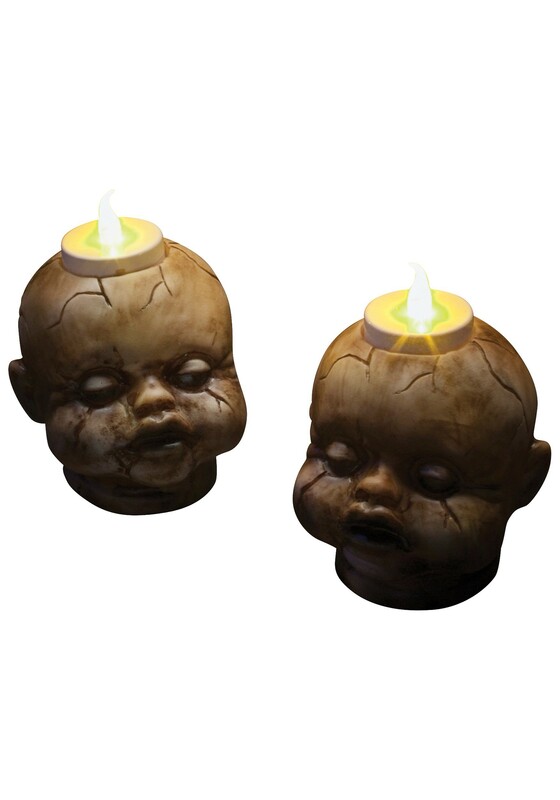 Not suitable for real tea lights. Still, I wouldn't mind just using battery lights, but one of them arrived broken. I'm sorry to hear that! Did you happen to reach out to Customer Service regarding this? They are always willing to help when there's an issue with any order.